Fouling stands in technical applications, for the unwanted growth or formation of deposits on surfaces. Fouling occurs on the inside of pipes, machines or heat exchangers. Either the substances responsible for fouling are already dissolved in the liquid. In water, for example, these are calcium carbonate and similar salts, in crude oil is next to others paraffin. Or solids are introduced together with the liquid from the outside, with the feed into a system. These are sand, mud or organic material. This is especially the case if well water or water from lakes or the sea is used. 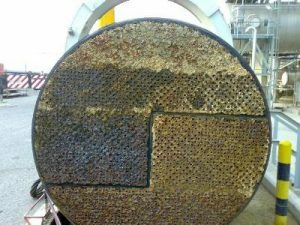 If fouling or biofouling is present in a system, corrosion might arise as a side effect. The pattern is almost always the same. Pipes and systems are over time covered with deposits. These deposits reduce the cross-section of the pipe and thus impede the flow and heat transfer. In the case of mineral fouling, lime or similar deposits form hard crusts. In the case of organic material, it is first biofilm which then leads to biofouling. Or even barnacles or mussels in seawater. Corrosion can occur because the deposits often still contain stagnant water, which can lead to corrosion due to outgassing. Or in biofouling, even organisms that are responsible for microbiologically induced corrosion (MIC). The photo to on the left shows the tube face of a 6-pass shell-and-tube heat exchanger. The fouling is a mixture of organic and inorganic material. You can clearly see that the deposits are thickest at the first pass and become less towards the last pass. The Merus Ring works against all the main causes of fouling mentioned above. Often this is a combination for several reasons. Merus experience shows that even if the fouling cannot always be stopped completely, it is at least greatly reduced. Teh benefit for our clients, either no cleaning is required or the intervals between the individual cleanings increase. This might lead to considerable savings. Unfortunately, Merus can do nothing against material introduced by the feed water, such as sand, mussels or mud. A filter must still be used for this. However, if there are less limescale deposits and corrosion in the system, sand or sludge have fewer adhesion possibilities and are rinsed out more easily with the liquid. For some years Merus has been used successfully not only in water, but also in crude oil against fouling. However, how good the improvement is ultimately depends on the composition of the crude oil. You can find more information on this topic on our homepage www.merusoilandgas.com.